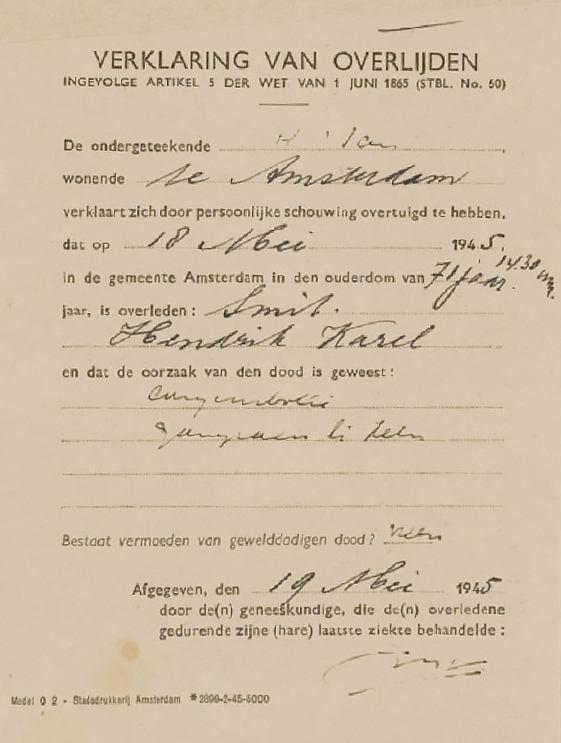 Hendrik Karel, nickname Henk, was born in the parental house at the Baangracht, baptist Reformed, son of Hendrik Karel Smit (1843-1897) and Maria Magdalena Perotti(1844-1927). He married on January 17 1900 with Helena Stuijf (1871-1959) and they got three children: Helena Maria (1895-1984), Martinus Hendricus, died young of age, (1903-1904) and Hendrik Karel (1905-1989). 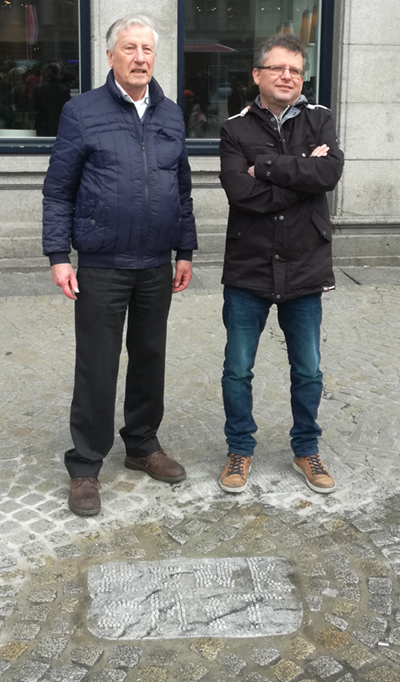 On May 7, Henk walked from the Marnixstraat to the Staalstraat, were his son Henk runs a chemistry. At the Dam he was hit by bullets and was brought to the Binnengasthuis. ‘My grandfather was by sheer accident at the Dam when the shooting started. He was hit by several bullets. The doctors from the Binnengasthuis were surprised that he had survived for another ten days. My father and I went to the Binnengasthuis but I wasn’t allowed to go inside. I was only 11 years old but my father forbid me to go inside. I always blame him for the fact that I couldn’t see my grandfather. He laid there all days until his dead’. ‘Father told us that his father was on his way for a bite to eat and always walked from the Marnixstraat through the Staalstraat, but because of the festivities at the Dam, he walked via the Dam. He was hit by a lot of bullets,8, and was brought to the Binnengasthuis and died there’. ‘Patient was registered on May 7 1945, in the Binnengasthuis, and was hospitalized, due to a complicated fracture of the big toe left, as a consequence of a shot wound run up by the Dam.The big toe was amputated. He died May 18 1945’. Further information was not found in the archive. On the death certificate is mentioned as cause of death: pulmonary embolism, gangrene left toe. ‘Mr. H.K.Smit, was seriously injured by the Germans during a clash, when he passed the Dam at May 7 1945 in Amsterdam,and died on the consequences of it on May 18 1945 in the Binnengasthuis’. Henk Smit died at the age of 74 years on May 18 1945 at 02:30pm. 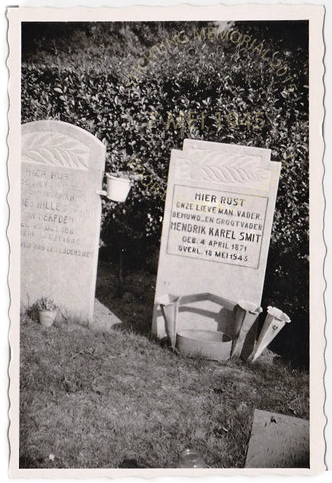 Henk Smit was buried on Wednesday May 23 1945 at the Nieuwe Ooster. Helena Smit-Stuijff died at the age of 88 years old on November 19 1959 and is buried by her husband. Both graves has been cleared. In September 2016, was established by the Board of the Foundation Memorial 2015 for Dam victims, that Hendrik Karel Smit was the 32 victim of the shooting at the Dam. Thanks to the family for the photos.